Europe’s General Data Protection Regulation (aka GDPR) is a new and far-reaching privacy regulation that takes effect from 25th May 2018. The Boxted Village Website is committed to ensuring that your privacy is protected by collecting minimal and lawful data at all times. When you visit this website for the first time, a small text file called a cookie asks permission to be placed on your computer’s hard drive. Cookies are small pieces of data stored on your device when websites are loaded in a browser. They are widely used to ‘remember’ you and your preferences. They ensure a consistent and efficient experience for visitors. If you agree, the file is added. You can choose to accept or decline cookies. Most Web browsers automatically accept cookies, but you can usually modify your browser setting to decline cookies if you prefer. This may prevent you from taking full advantage of the Website. If you complete the online contact form, you are asked for your name and email address only. These are used only for lawful processing i.e. enabling a response to your query. We do not at any time pass your details on to any third-party unless we have your explicit permission or the law requires us to do so. This Website may contain links to other websites. However, once you have used these links to leave this site, you should note that we do not have any control over that other website. Therefore, we cannot be responsible for the protection and privacy of any information which you provide whilst visiting such sites and such sites are not governed by this privacy statement. You should regard the privacy statement applicable to the website in question. 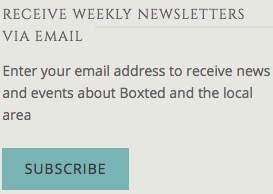 If you subscribe to the Boxted Village newsletter you are explicitly giving consent to receive the newsletter only. You can unsubscribe at any time. Provide a legitimate service to you. If we become aware of any data breaches, we will inform you within 72 hours. You may request details of personal information which we hold about you. Please email boxtedvillagewebsite@gmail.com. If you believe that any information we hold on you is incorrect or incomplete, please write to or email us at the above address as soon as possible. We will promptly correct any information found to be incorrect. The GDPR 2018 gives you the right to be forgotten or removed from our records at anytime. Please email boxtedvillagewebsite@gmail.com and we will erase any details we hold on you.